Whether your power plant is coal-fired, gas-fired, hydroelectric or nuclear, petroleum-based products like fuel, hydraulic fluid and lubricating greases and oils are critical to operational success. Supporting numerous lubricant connections, bearings, hydraulic seals and moving equipment parts, such as pumps, conveyors, feeders, scrubbers, cranes, turbines and more—it’s inevitable that these petroleum-based products will find their way into the process, cooling, or cleaning water that flows throughout a plant—posing operational challenges. Outflow collection point of a recirculating cooling system. Outflow collection point of a once-through cooling system. Outflow collection point prior to the waste treatment facility. Drainage sumps or pits deep within the plant. At any of these points, removing the oil from the water can greatly enhance a power plant’s wastewater treatment process and help minimize future operational issues. For decades, those in the power industry have been realizing the benefits of using oil skimmers—from reducing labor and maintenance costs to reducing or eliminating waste oil disposal costs and reducing or eliminating the need for filtration and chemicals. However, there are several different types of oil skimmers on the market and for optimal success, a power plant needs to select a skimmer that is sure to meet its specific needs. Vertical lift: An oil skimmer must be able to reach the oily water where and when oil removal is needed. Drainage pits or sumps may be located up to 100 feet deep in the structure of a plant, making them difficult to access for inspection or set-up, adjustment, or maintenance of skimming equipment. Choosing an oil skimmer with vertical lift capability can eliminate or greatly reduce these problems. Adaptability to water level: Within a pit or sump, oily water levels can fluctuate widely, making it difficult to apply and remove absorbent media, or access and operate a slotted pipe, for example. Selecting an oil skimmer that can easily adjust to changing water levels without supervision eliminates the potential for untreated water to overflow into other areas of the plant. Guaranteed removal: Numerous skimmers have the ability to remove a thick layer of oil without drawing in free water, but not all can remove thin oil sheens. Selecting an oil skimmer that can remove both large and small amounts of oil in varying concentrations is important in reducing or eliminating the need for additional filtration equipment or wastewater treatment chemicals. Continuous operation: If floating debris is a common occurrence in a power plant drainage system, it’s imperative that the chosen skimmer can easily maneuver around it. When debris is present, some skimmers simply can’t perform well, resulting in increased maintenance needs and operational downtime. However, some skimmers are designed to move around debris and avoid clogging, ensuring ongoing, uninterrupted operation and positively impacting a plant’s bottom line. Tube-type oil skimmers from Oil Skimmers, Inc. feature a specially formulated closed-loop oil collector tube that skims the surface of the wastewater. Oil adheres to the outside of the tube, while the tube moves easily around floating debris. The floating tube is drawn across the surface of the water, into the oil skimmer and through ceramic scrapers that remove the oil. The tube then returns to the water surface to collect more oil, while the recovered oil flows to a collection container, making tube-type oil skimmers ideal for power plant applications. 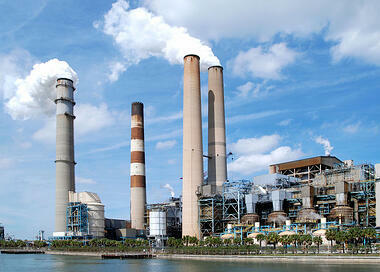 To discuss how to select the right oil skimmer for your power plant, contact us. info@oilskim.com or (440) 237-4600. © 2019 Oil Skimmers, Inc.